It’s summertime and you’re outdoors enjoying the great weather. Wouldn’t it be nice to rinse off when you wrap up at the beach? There’s not always a place to wash handy when you need one. That’s where a portable pressure sprayer comes in handy. With these compact camping showers, it’s easy to clean off beach sand, mud from the park, or trail dust from a long hike. Let’s take a closer look at why everyone wants one of these emergency portable showers this year. We’ll start with the RinseKit. Never fear getting dirty in the great outdoors when you have this essential tool with you. It’s true, you can take a hot shower in the wilderness. If you fill up the RinseKit 2-gallon reservoir with hot water, it works like a Thermos. You don’t need to leave it in the sunshine or power it with a car battery. The RinseKit is insulated to retain heat. You can enjoy a hot shower at the end of the day when temperatures are cooling down. Doesn’t that sound so much better than dumping cold water over your body? The RinseKit portable pressurized emergency shower isn’t just for bathing people and pets. How many times have you had to pack up your fishing gear, your surfboard and wetsuit, or any other outdoor equipment when it was still dirty? That’s not good the for gear, plus it just makes more work for you later. Like we mentioned, this holds up to two gallons of water. To fill it, first lock the lever near the nozzle. Then unscrew the nozzle and connect the 6-foot-long hose to your sink faucet or a faucet outdoors. 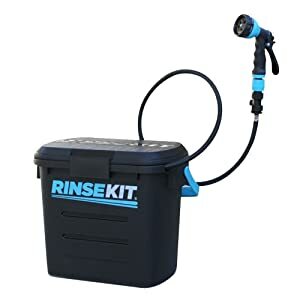 The RinseKit comes with a plastic bib adapter that fits on an outdoor spigot, but you’ll need to use the metal adapter to connect the hose to a kitchen or bathroom sink. Now open that same black lever again so water can flow into the reservoir. Turn on your water source and wait between 20 to 30 seconds for the RinseKit to fill. You should be able to hear the water flowing into the tank, then stop. Shut off the black lever and screw on the spray nozzle. Your portable pressurized shower is ready to use. Wait a minute—how can it be pressurized already? The water inside the RinseKit reservoir is under pressure because of the water pressure coming from your faucet. You don’t need to pump anything, shake it, hook up batteries, nothing at all! This portable camping shower is better than a garden hose—unless you happen to have a really nice nozzle on your hose. The nozzle on the RinseKit gives you seven pressure settings, from “jet spray” to “soaking shower.” The slower the flow, the more wash time you’ll have. For example, the tank will give you up to 4 minutes on the lowest level, or a minute and a half at full blast. Even better, if you brought the RinseKit along on a road trip, but haven’t used it for a few days, it doesn’t matter. While the water may not be hot after a day of sitting in the car, the water pressure holds up for up to a month. Like an Easter egg in a movie, the RinseKit has a few hidden extras under the hood. It comes with a built-in ruler and a removable lid. The company suggests using these two tools to measure your catch of the day or keep your feet clean while you change clothes. By the way, once you remove the lid, you’ll see where you can store the hose, nozzle, and faucet adapters inside the RinseKit itself. Check out this video to see how this cool camping shower works. Let’s switch gears to another product, the Ivation Outdoor Portable Shower. Unlike the RinseKit, this one runs off a battery. You’ll need a water source, too, like a bucket, a sink, or other container. The Ivation is actually a pump, not a self-contained pressure sprayer like the RinseKit. The Ivation is rechargeable, which is good and bad. It’s good because you don’t need to run out and buy more batteries to use it. But it’s also bad if you don’t have a car adaptor or computer close by to recharge it. It does run for about an hour, which should be good enough for the whole family to rinse off, or washing desert dust off the SUV. It comes with a suction cup so you can shower hands-free by sticking the nozzle to a smooth surface. You can also use the included hook. The hose is 6.5 feet long to help you move around a bit without having to drag the bucket along behind you. 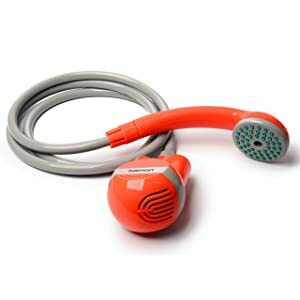 The pump end of the hose is weighted to stay put inside the water while you use it. While you can’t change the pressure that the Ivation pump creates, water flows out of the nozzle at .66 gallons per minute. This ends up feeling like a gentle rain, which may not be enough to blast away mud, but it’s definitely economical when you have a limited water supply. Watch how the Ivation works in this video. When you’re shopping for a camping shower, you have a lot of choices. The RinseKit is a smart way to wash away from home. You can control the heat as well as the water pressure. The tank is compact and lightweight, perfect for packing along in the car. The Ivation portable pressurized sprayer is a water pump that is even lighter and smaller for bringing along on the road, but you’ll need to have a water source to use it and a way to recharge it when the battery runs down. Check back with us again soon to see new reviews of the best in outdoor gear and gadgets. We want you to enjoy your summer to the maximum!